Hold and Release is available on Amazon and Small Press. what complication of molecules, your children. and guide you with the flow or against it. A woman stands by a fountain throwing her lunch to pigeons. was a vital connection missed or escaped? was set upon by a monkey and bitten to the bones of her cheek. like an over-wintered apple in the root cellar. before she could open her mouth to scream. the buffalo turned, and returned, to the water swaying with reeds. Poem by CB Follett from "Hold and Releaset." 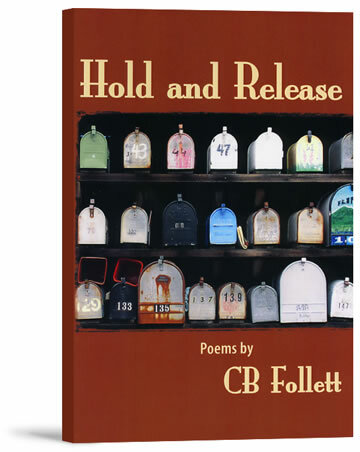 "Hold And Release" is award-winning poet C.B. Follett's fifth published book of free verse poetry in which she takes up themes of family history, near-forgotten secrets, the inspirations of love, the deprivations of loss, and the nature of beauty. An accomplished poetry of considerable imagination and an undeniable flair for language, Follett's unique style of engagement is to be admired, even savored, poem by poem and verse by verse. CB Follett’s remarkable new poems illustrate the delicate yet often painful ways we grow into – and beyond -- the fabric of our families. The profound intimacy of ‘Lyn Follett’s poetry is often set against both the great beauty and the implicit danger of the natural world, as the many branchings of a life reveal themselves to be either, and sometimes both, the sweet limbs of possibility or the broken reckonings of experience. This is a gorgeous and memorable collection of great power, wisdom, and grace.